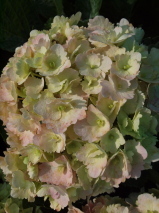 Hortensia group. Dense vigorous multi-stemmed shrub with lush mid-green leaves, bold and saucer-shaped. In summer it has large clusters of dark pink flowers with whitish edges and some double florets. Flower colour can vary from dark pink to purplish depending on soil acidity. Very pretty. The flowers form on two year old wood. Thin out crowded stems in late winter, shorten where necessary. Hardy for cold sites. Best in semi-shade, with good soil moisture. Small, height between 1 and 1.5 metres. We have this currently available in a POT 4 container. Ask for it at your retailer.